Start your ride along the shores of the St. Clair River in the quaint town of Sombra. 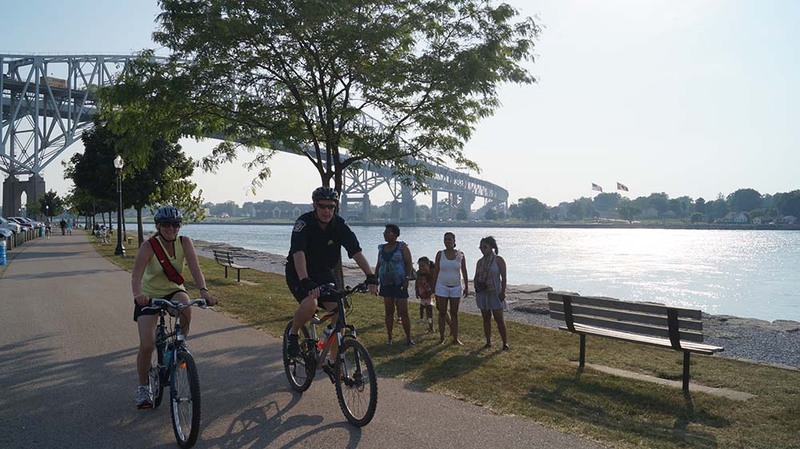 Enjoy 35km of wide paved shoulders, waterfront riding and great views of massive freighters as you cycle along the signed St. Clair River Trail (also part of the Great Lakes Waterfront Trail) along the St. Clair Parkway. Take a break in Mooretown at the waterfront Mooretown Centennial Park and make time to visit the Moore Museum. Follow paved trails and quieter city roads through Sarnia to reach the waterfront community of Point Edward, where the south shore of Lake Huron empties into the St Clair River. Enjoy the famous local treat of fresh cut fries by the water as you wave to the many sailboats and large freight ships passing beneath the Blue Water Bridge. Journey a short 4km to reach Sarnia’s shimmering Blue Flag Beach. Located in Canatara Park. This immaculate beach earned its world-renowned Blue Flag eco-certification for supreme water quality, safety, accessibility and environmental protection. Go for a relaxing dip in Canatara’s clear turquoise waters, relax on the sandy shoreline and take in the park’s beautiful scenery. Canatara Park has 200 acres of green space to explore via trails and bike paths, and it’s an excellent place to spot warblers, sandpipers, ducks and falcons. Alternate Grounds Dockside This dockside restaurant in the Sarnia Bay Marina might just have the best patio in town. Watch the sun sink into the water as you dig into much-loved dishes like delicious fish and chips, hearty burgers, and cajun and creole inspired feature items. Refined Fool Brewing Co. This hidden gem located downtown Sarnia offers carefully crafted microbrews in a trendy and welcoming atmosphere. Relax in the friendly taproom and sample fresh cream ale, vanilla porter, German wheat beer, grapefruit IPA and much more! Visit the Refined Fool retail shop and grab some growlers or bottles to go. Judith & Norman ALIX Art Gallery No trip would be complete without stopping at the JNAAG. Discover contemporary art exhibits featuring the finest Ontario artists in downtown Sarnia. The permanent collection showcases paintings by iconic Group of Seven artists, as well as Canadian national treasures. Bike Shops in Town: There are two bike shops in town if you need to pick up supplies - The Bicycle Shop and Blackwell Cycle. Where To Stay Rest your head at one of Sarnia’s reliable, quality hotels located along Venetian Blvd. Hampton Inn, Holiday Inn, and Best Western are the best tried-and-true hotel picks. Jump back in the saddle and head north along the scenic cycling route through the bedroom community of Brights Grove. This tiny town was once a dance hall destination that drew stars including Louis Armstrong and Guy Lombardo. Riding east, you'll be following portions of the Bluewater International Gran Fondo route, an event that draws several hundred cyclist each August. This is also a section of the signed 2,100km Great Lakes Waterfront Trail. Dig into a hearty lunch at Camlachie’s Sawmill Creek Golf Resort & Spa, which offers a cozy dining lounge with wood-burning fireplaces, big screen televisions, and panoramic golf course views, before making a short detour inland to visit the certified bicycle friendly Alton Farms Estate Winery, where owners Marc and Anne Alton are pioneering Ontario’s newest Huron Shores wine region. Journey another 48km north to reach Grand Bend. This quintessential beach town comes alive in the summer, and the sumptuous stretch of sugar sand beaches is the true star of the show. Grand Bend’s clear, turquoise waters and powder white sands make many visitors feel they’ve discovered a slice of the Caribbean in Lake Huron country. Grand Bend has earned a reputation as one of Canada’s best beach towns, and its Blue Flag certified beach draws people of all ages. The main strip, anchored by the town’s large beach, is buzzing with patio restaurants and friendly bars to choose from. Enjoy a scenic lakeside dinner at certified bicycle friendly Smackwater Jack’s Taphouse or indulge in flavourful Japanese cuisine at Midori Sushi, set right in the heart of the village. Swing by Grand Bend’s new beachfront stage and catch some live weekend entertainment as the sun sets. Pinery Provincial Park If you have time during or after your cycling tour, be sure to explore the pristine Pinery Provincial Park. Just down the road from the village, you’ll find 21 magnificent square kilometres of rare forests and rolling dunes with over 14km of scenic , crushed stone biking trails winding in between. Hike one of ten gorgeous nature trails, explore the Old Ausable Channel by canoe, kayak or paddleboat, and sink your sand into the ten kilometres of sandy lakefront beach. Sunsets here are ranked by National Geographic as among the “Top 10 Best in the World”, so don’t forget your camera. River Road Art Galleries Lambton County is home to a thriving community of incredibly talented artists. River Road hugs the Ausable River and it’s here that you’ll see original works from the area’s most established artists. Discover award-winning local photography, painting and sculpture at Sunset Arts Gallery, as well as the Castaway Art Studio located right next door. Where To Stay Grand Bend has a range of friendly, family-owned hotels, motels and resorts to choose from. In the warmer months, be sure to book ahead to avoid disappointment. The Pine Dale Motor Inn and Oakwood Resort offer the best accommodations in town. This three or four-day ride begins and ends in Sarnia taking riders on a scenic cycle along the St. Clair River for the first day. On the second and third days, riders get to explore the region’s rural roots as well as the area’s fascinating ties to the Underground Railroad and Canada’s oil industry. When it’s time for a break, this route has plenty to offer. Cyclists can enjoy best-in-class beaches, antique shops, interesting museums and National Historic Sites, live theatre, farmer’s markets, and great local restaurants and cafés.